To know freedom is to know Nature. Living in harmony with Nature leads to peace, prosperity, knowledge, truth, action, and freedom. Nature reflects the order of the universe. Living in opposition to Nature leads to war, control, ignorance, fear, stagnation, and enslavement. Today, America, The Land of the Free and Home of the Brave, finds herself in shackles and homeless. The foundation of American freedom is cracked. New restrictive mandates form the walls of a prison cell which we have built through our own apathy and ignorance. The original Charters of Freedom: The United States Constitution, The Bill of Rights, and The Declaration of Independence were written to reflect Inherent ights of the individual. Yet these documents are being ignored by the very government created to uphold them because, by themselves, they are only metaphorical shields. Why are we losing freedom? Because we have forgotten where our rights come from. Human rights are natural and inborn, granted by the Creator. They come from our humanity under the Laws of Nature. Natural Law and Justice is, and always has been, the primary fundamental force in the universe. It is a body of Universal Spiritual Laws which governs Consciousness. Consciousness creates through each of us using free will. We are consciousness. We have stopped taking action to secure freedom. We thought that when we created government in America as a Constitutional Republic, individuals would be recognized to hold certain inalienable rights; rights which are not transferable and which can never be revoked, regardless of what the majority wants, or who holds power. However what we have agreed to is a Democracy. A Republic is where the people control the government. A Democracy, is where the Government controls the people. Rights granted and legalized by governments are not rights at all. In fact, they are privileges that can be altered restricted, and taken away by legislation or Executive Orders. These privileges are codified (codes) in legalese. Legalese is the language of statutes, which redefines words as tools to expand the scope and power of the State. Under statutes, a “person” is a legal fiction, not a human being with free will. At the same time, a “corporation” is defined as “a number of persons united in one body, so it can acquire wealth, expand, and enjoy other rights.” Note: a corporation is incapable of loyalty or love. Governments also regulate behavior through licensure. A license is permission to do something otherwise deemed to be illegal. A government that gives itself power by its own authority is a rogue government and must be restrained, or else the trend is toward a concentration of power where laws are homogenized and standardized to one-opinion rule -a monarchy. Unless we can wake ourselves up, the United Nations (UN) International treaties (UNCRC), intend to “reduce inequality” by implementing new norms of global socialism and corporate fascism as part of their Post-2015 Sustainable Development Goals. to claim responsibility for individual choices, and the consequences of those choices. When governments ignore the will of the people and “go rogue” for the benefit of the few at the expense of the many, it is time to remember from where true freedom comes. Our system derives from our free will and consent. One belief system says that a human being is separate from all others, designed to control others when they cannot or do not reason for themselves. This belief derives from man-made written codes that must be learned. On a free-will planet, everything is presented as an offer to contract and it is always up to each of us to consent or to withdraw consent. Silence is acquiescence. Ignorance of the law is no excuse in the Age of Information. There is a difference between legal and lawful. Legal pertains to the letter of law, whereas lawfulpertains to the spirit of law. Legal matters reflect statutes between government entities and the color of law (i.e., the appearance or semblance, without the substance), whereas lawful matters reflect common law, the law of the land—the law of the people—and are actual in nature, not implied. Going forward, if we are to be free, we must resist playing a game of wits in a corrupt system that seeks to destroy Inherent Rights. Instead, we must take back the language and determine who we are. Are we a “person-corporation” or a soul embodied? Do we have free-will or do we ask for permission from an outside authority? Do we consent to the dictates of a rogue government or do we withdraw consent? Do we own our bodies or does the State? Do we recognize inalienable rights and act on them? Do we reclaim our sovereignty as free-will beings? It is time to redefine the words we live by to work in our favor. 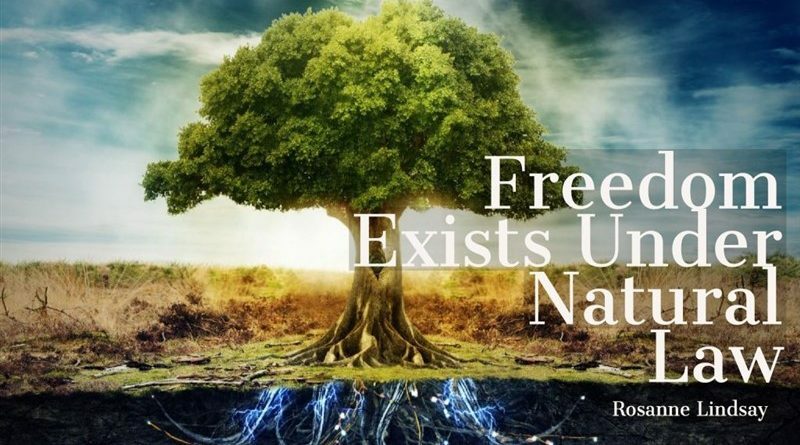 As part of nature, we must connect to Nature to experience freedom. As Within So Without. When we follow government dictates as truth, we lose touch with our own intuition. We lose connection with our true nature. As long as we remain distracted, debating the details of the system (war, mandates, rigged elections, the NFL, science, abortion, self-identification), we are directionless, lost in a maze of confusion. By consenting to a system of contradictions through our participation and acceptance, the system feeds off our energy. If America is held up as an example of Freedom to the rest of the world, we must get our act together and identify with Natural Law. Through the power of our vision we become the architect of the life we want to create for ourselves and for our families. We only need to reclaim responsibility and act on it in order to see it emanate out to affect all life. Such is the Law of Nature. Rosanne Lindsay is a board certified Naturopathic doctor under the Turtle Island Provider Network. She is a writer, Earth Keeper, President of the National Health Freedom Coalition, co-founder of Wisconsin For Vaccine Choice, and author of the book The Nature of Healing, Heal the Body, Heal the Planet. Find her on Facebook at Rosanne Lindsay and Natureofhealing and consult with her using the tools of nature to heal yourself (long-distance consults available) at natureofhealing.org., where this article first appeared.